Oh, Oh, in the last newsletter I forgot to mention our wrong turn made during the hike up to the water falls. About ½ mile from the falls, we took the wrong path and wound up in an indian village of three or four hundred people. It was located on a sort of steep hillside. The huts were all standard fare made with vertically tied sticks and thatched roofs. No doors, and of course dirt floors. There were lots of children and they, as well as the moms, were fascinated with Maggie. There were also many dogs, but they were short haired skinny yellow dogs with regular dog noses. Maggie's stubby beak and big eyes really got their attention. They also thought it very strange that we carried Maggie. (We had to at times because of the other dogs and because occasionally she got so tired). We had a following all the way through the village and then, when we discovered our directional mistake and turned around, they stayed with us all the way back through the village. Everyone was friendly and all smiles. Again, they were very attractive people. 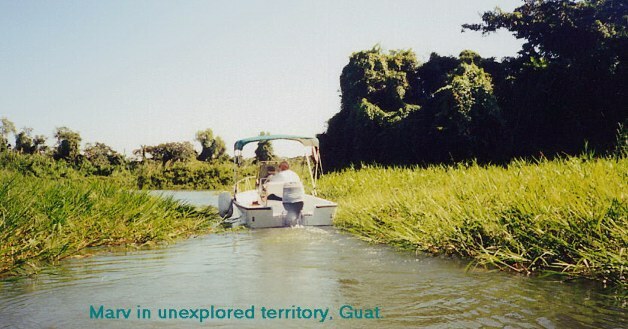 Monday afternoon we went dink riding up several rivers and their tributaries at the westernmost extreme of Lago Izabal. These rivers were somewhat different from others on the lake. They were lined with water hyacinths (some blooming) and many blooming water lilies and more orchids. Very pretty. The area was loaded with howlers and they really whooped it up. There were also a couple of species of large birds and congo flies not seen before. 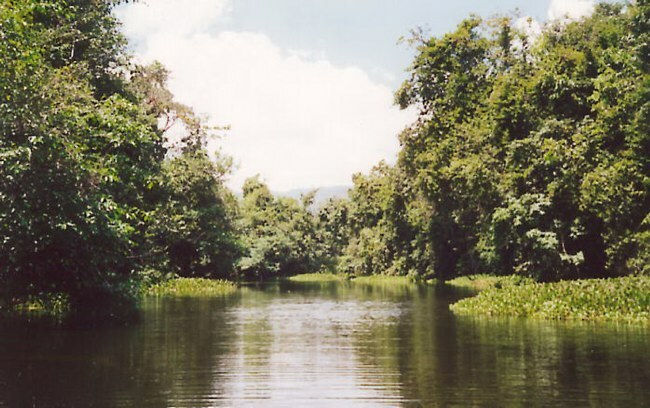 The congo flies life cycle may involve the water hyacinths as they don't seem to be found outside of this area. These little bastards can bite mightily and take meat with them as they go. Fortunately, as long as the dink was moving, they were not too bad. Woe be to he who has outboard motor trouble in those parts. After exploring to the points where the creeks were no longer passable, it was great running back at high speed in the very snakey switchbacks. Not a very naturalist act, but sometimes you have to let the kid out and just have fun. Joan and I picked some water Lilly and hyacinth flowers and later put them in water on the boat. They Lilies close up at night and bloom again at first light each day, but the hyacinths fizzled in a few hours. Very pretty and smell nice too. In the afternoon, we hauled anchors and headed for the southwest shore of the lake, anchoring very near the base of the 9800 foot peak. Clouds hovered over all of the peaks and fingers of low scud were in all the high valleys and depressions. As the day progressed, the immediate area became overcast and there was intermittent rain. To the east, however, it was clear and a full moon was rising. About 7:00 PM, there was an Erie glow in the west. At first we were all confused about what it was. There was an arc of diffuse white light from the south shore of the lake that appeared to extend up several thousand feet. It reminded me of a searchlight, but with a curved beam. After a while, the arc extended fully to the water at the other end. It was a rainbow from moonlight. Well, just about the time you think you'd seen everything, wham! I've never heard of such a thing, have you? Marv named it a “moonbow”. It was a shame we didn't have any high speed film on board to capture the event. In this area, even though there are some buildings and shacks in the trees along the shore, no lights showed anywhere. Tuesday morning found us in a cold drizzle and heavy fog. The visibility was so poor that at times we could barely make out the nearest shore. The mountains, otherwise so prominent, were as though they didn't exist. Oh yes, we found the bugs. The boat was covered with deceased little black bugs and mosquitoes were also on hand. I think that the little black bugs were something like mayflies, only a very short lifetime as flying bugs. There was no point in trying to do anything except read on Tuesday, but we did make a big pot of veggie soup and the Heides joined us for a late lunch. Using a bucket, we washed the bugs off the decks. The weather didn't bother the locals, however, as a number of cayucas cruised around checking their gill nets and hand line fishing. This morning, the weather has broken and there are clear skies even over most of the mountain tops. When it warms up a little, we hope to explore three nearby river canyons. Then, we plan to move further east on the south shore this afternoon.